This gorgeous three-bedroom, three-bathroom condo is located at the exclusive Margate Towers in Kingston Plantation. This spacious escape is the perfect destination spot for a relaxing vacation! Stylish and beachy this condo can sleep up to eight guests comfortably. The master bedroom features a king-size bed and spacious relaxation with a TV as well as a full-size private bathroom with jetted garden tub, shower, dual sinks, large closest with plenty of space and balcony access. The second room is spacious and bright with one king-size bed, a flat screen TV and a private full bath. In the third room there is two-queen beds as well as a balcony entrance and a flat screen TV. All bedroom provide guest with comfortable bedding and a quiet relaxing space to rejuvenate after a fun-filled day at the beach and visiting all the amazing local attractions! There is a total of three full-size bathrooms in this condo. There is also a nice open floor plan that combines both the living room and dining room with your kitchen area. The Kitchen is fully stocked with everything you’ll need to make the perfect meal! This includes a full-size appliance such as, a full-size refrigerator, stove, microwave, coffee maker, dishwasher, and all the pots, pans, dishware you will need during your stay with us. Off the kitchen is your laundry room area with a full-size washer and dryer for your convenience. The balcony is truly the selling point of this unit. it wraps around the entire side of building providing our guests with stellar views of both Kingston Plantation and the Atlantic Ocean. Accessible from all three bedrooms and the living room, it is a fabulous, unique space that you are sure to spend your morning watching the gorgeous sunrise! 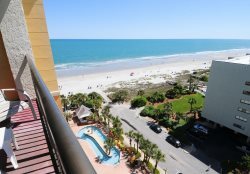 You will be sure to visit this condo on every trip to the beach! So, come enjoy your stay at the Margate Towers!! Enjoyed the condo very much. Thanks.